This past Saturday (June 15, 2013), Charis and I attended my nephew's funeral in my home town. I was asked by my aunt to go pray for one of her sick neighbours, a woman I last saw 30 or so years ago and affectionately call Aunt Lily. I went to Aunt Lily’s house accompanied by my daughters Charis and Jaydeen, son Johnny and my neighbour’s daughter (age 8 years) who went with us to the funeral. We knocked on Aunt Lily’s door and she replied by knocking on her bedroom window, indicating that we could enter. She could not speak as she had a mask over her mouth. We entered her room with greetings and I explained to her who I was. She removed the mask and tried speaking to us but there was a problem as she was struggling to breathe. She coughed profusely and put the mask back on. I spoke a few encouraging words in the name of the Lord Jesus Christ and I asked her if she needed to accept the Lord and receive healing. She nodded in agreement and I asked the children who accompanied me to join me in prayer and faith for her healing. I prayed for her and led her to the Lord in prayer. Immediately after she accepted the Lord, she removed the mask and spoke with ease and without difficulty. When we saw this miracle right in front of us we rejoiced with her. I asked her if we could take a few pictures of her to share her and our joy with others, she heartily agreed. As we left, I went to exchange my final greeting to her by her bedroom window. While she was waving me goodbye, I took a final picture of her from the outside. We have included pictures we took before we prayed for her and after prayer. 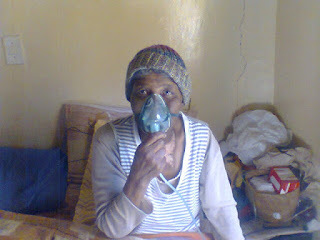 Briefly, Aunt Lily told us how she was diagnosed with cancer and had suffered severe pain as she underwent treatment. She had not been saved (born again) and she had unforgiveness towards the doctors who treated her and caused her skin to burn. She showed us on her chest/neck area the burning scars from the chemotherapy. Soon after her explanation, we bid farewell to her and we all left rejoicing. Yesterday (Sunday, June 16, 2013) around 3:00pm I received a telephone call from my sister, informing me that Aunty Lily has just passed away. Upon hearing this news, I REJOICED in the LORD and exclaimed, HALLELUYAH! I rejoiced not because she died, but because she died in the LORD! We wanted to share this testimony with you so I asked the Lord in prayer last night if He could show Charis whether Aunt Lily made it to Heaven. Glory to JESUS CHRIST, HE SAVED her on her death-bed! We rejoiced when we saw her speaking by herself without the mouth mask, but we are EXCEEDINGLY JOYFUL that she accepted the Lord and died in Him. The Lord Jesus Christ said, "SHE IS FREE!!! !” in a LOUD VOICE! Rejoice therefore with us that Heaven received a soul (Luke 15:7). This picture was taken before we prayed for Aunty Lily. She tried speaking to us but choked due to too much air. Her voice was husky and frail. I took this picture after praying for her. You can see the burning wounds inflicted by the chemotherapy on her neck. As I was witnessing to her, I noticed two Bibles by her bedside and I told her to never close the Bible. 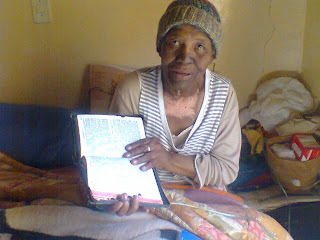 She immediately got hold of one Bible (the Afrikaans one) and while she opened it to read, I told her to start reading from Matthew and pray once we were gone. In Heaven, Charis saw her completely healed! This was the final picture I took of Aunt Lily before we left. 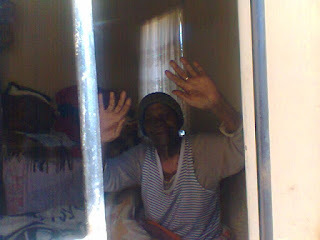 As she was waving, she praised the Lord and she reached for my hand for a final greeting through the window. I took this picture of my witnesses to this great testimony close to Aunt Lily's bedroom window. Below is an account of the vision that the Lord showed Charis this morning (previous visions are documented here). I had a vision from the Lord this morning. I heard the voice of the Lord saying, "Go outside!" As I went outside the house, the CLOUD of the Lord appeared in a dazzling white light with the Lord inside the cloud. I was transported into the cloud and I had a small white umbrella to cover me from the glorious splendor of the Lord. Immediately thereafter, I found myself in Heaven. The Lord disappeared and the umbrella was taken from me. I then saw Aunt Lily in Heaven sitting cross-legged on a wooden chair with glass-like pillars. Aunt Lily waved to me come over to her and she smiled and said in Afrikaans: "Se jou pa ek se dankie dat hy vir my gebid het en my na die Here toe gely het. 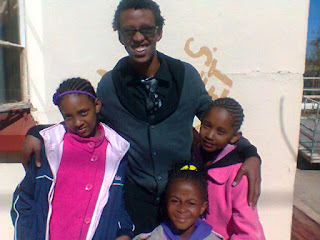 Die Here wou my nie genees het nie, Hy wou my net huis toe [Heaven home] geneem het het soos jou pa gese het. Dit is baie lekker hier in die Hemel.” I replied and said, “Ek sal so maak en dit is n plesier van my kant af.” Translation: “Go tell your father I say thank you that he prayed for me and led me to the Lord. The Lord did not want to heal me, but He wanted to bring me home in Heaven as your father said before he prayed for me. 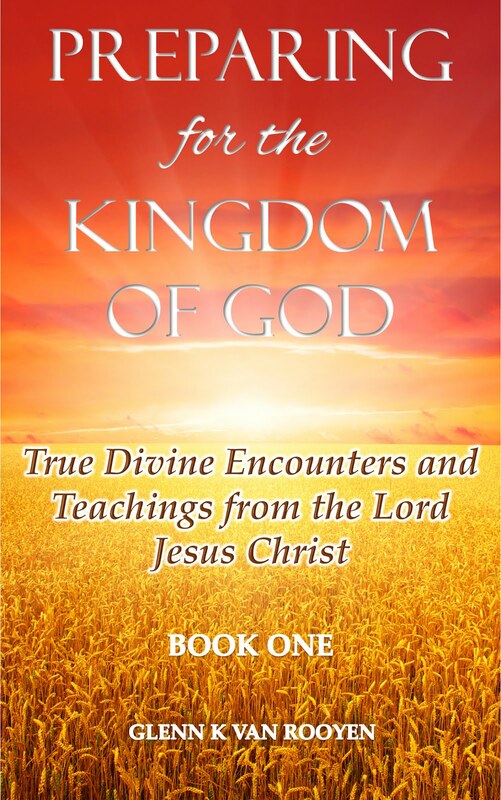 It is very nice up here in Heaven!” I (Charis) replied and said “I will tell him and it is only a pleasure from my side.” She then showed me that the burn scars that had been inflicted on her chest by the chemotherapy were gone. Aunt Lily then got up from the chair and she started to turn around like a little girl rejoicing in a pure white dress with silky white bally-like shoes. There were pure white lily flowers with her name on the side of the road. I saw her picking these flowers and blowing them in the air. She turned around and looked at me smiling, and she jump up with her hands in the air. As she jumped, she was suspended in the air and I saw a BEAUTIFUL GOLDEN CROWN with the name “LILY” on it as it placed on her head. I then saw a rainbow-shaped banner appearing on her right side in yellow ink: "SHE IS FREE"!!!! I told her "Ek moet nou gaan" (“I have to go”). She looked at me and smiled. I returned the smile and turned around and the vision was over. In conclusion: Do not undermine God and what He wants to do for other people. Go out in obedience and pray for the sick and preach the gospel to populate HEAVEN! Be blessed in Jesus name as you share this vision and testimony! 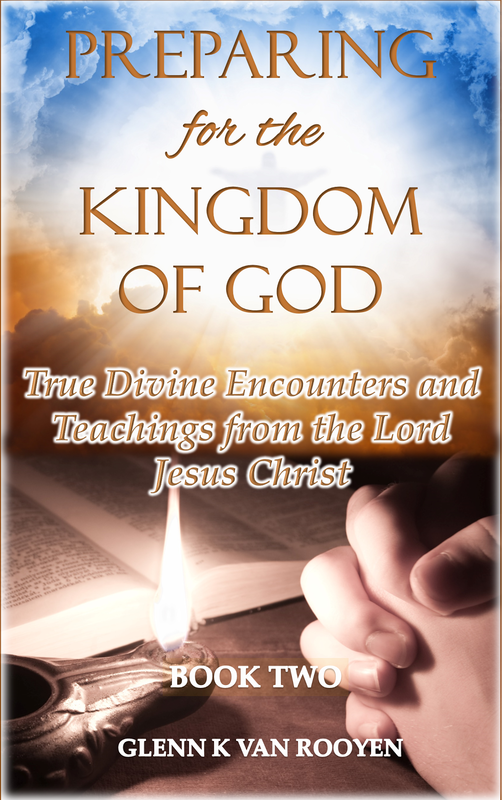 This is a suggested way of leading someone to the Lord after sharing the gospel with them, you may click Here.